Law Day 2016 - Get Involved! The State Bar of Texas and Texas Young Lawyers Association are encouraging our association to hold editorial, photo, and poster contests in our communities incorporating the national Law Day theme, Miranda: More than Words. We must submit our first-place local winners from each category to the State Bar for the statewide contest by Wednesday, March 30, 2016. The top three winners in each statewide category will be invited to the State Bar of Texas Law Day celebration, which will be held Monday, May 2, 2016 in Austin. Here is the Law Day brochure. Law Day is an excellent opportunity to educate the public on the importance of the rule of law and how our legal system strives to achieve justice. For a list of children’s books that compliment this year’s theme and for more information, visit the Law Day web page. Please download the December 2015 newsletter below. The Bar is looking to make this a monthly publication. If you have items of interest that you would like to see included, please email cindi@lindleylawoffices.com. 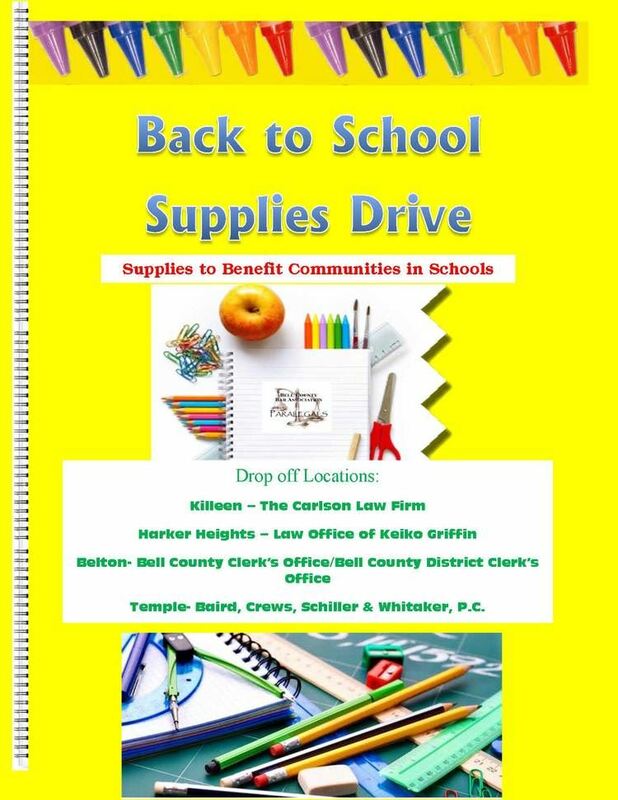 BCBA Paralegals are collecting school supplies to benefit Communities in Schools. See attached flyer for drop off locations. Supplies will be collected through August 21, so please consider picking up a few extra items when shopping for your kids!!! The Military and Veterans Law Section of the State Bar of Texas is pleased to invite you to attend its 22nd Biennial Institute on October 8-9, 2015. This CLE is open to all Texas attorneys, military attorneys and government attorneys. Reserve your guest room: The discounted guest room rate is $115 for all attending the institute. Call to reserve your room by September 8, 2015, to ensure that you receive the discounted rate. The reservations department can be reached at 1-866-527-1498 and select option 1. Once you speak with a reservations specialist, you will mention the group name: Military and Veterans Law Section of the State Bar of Texas - 2015 Biennial. Thank you for your membership in the Bell County Bar Association! Spring and Fall Golf Tournaments. Please fill out the membership application available here at your earliest convenience to renew your membership. Checks (payable to BCBA) and applications can be mailed to PO Box 282, Belton, TX 76513. If you prefer to pay by credit card, follow the instructions on the application. Ours is a vibrant and involved Bar Association, well respected at the State level. Thank you for your participation. Members - You can now download the paperwork to be completed by those who wish to renew their Bell County Courthouse badge for the 2015 calendar year. The information you will need are: 1) Memorandum, and-- either 2) Renewal Application, or 3) Original Application. PLEASE DO NOT RETURN THIS PAPERWORK TO THE BAR, you must complete and present it to Bell County Human Resources Department when you go to have your badge issued / renewed. To have your badge issued / renewed, please go to the 3rd floor of the historical courthouse in downtown Belton. Present your paperwork to HR between 8:30 a.m. and 4:00 p.m. YOU MUST BE CURRENT ON YOUR DUES TO HAVE A BADGE ISSUED / RENEWED. BADGES WILL NOT BE ISSUED IF DUES ARE NOT CURRENT, NO EXCEPTIONS!!! HR is ready to begin issuing badges immediately. Remember, your current badge will expire December 31st!!! Kay Taylor, the amazing photographer who has donated her services for the last three Adoption Day Events, was able to get the Adoption Day program into the Bell County Living magazine, Fall 2014 edition. A link to the online version is here … the story starts on page 76!! Bell County will be hosting its SIXTH Adoption Day Event on Friday, November 14th. So far there are twelve families participating, adopting approximately twenty kids (though those numbers may change before the event!). It is anticipated that opening remarks will be made at 9:30 a.m., with the first cases being called at 9:45 a.m. If you or your firm are interested in making a donation to help offset the costs, please mail your check, payable to BCBA, to PO Box 282, Belton, TX 76513. Please note "Adoption Day" in the check memo so that your donation is applied correctly. For those who are new to the Bar, the Adoption Day event is to help finalize and create "Forever Families" for children who have been living in foster car, and who are being legally adopted by these families. The Bar provides each family with a gift bag that includes age appropriate toys for the children, as well as gifts for the parents, a disposable camera for the kids to use, and other goodies! The Bar also purchases pop up Wizard of Oz books for each family, and decorates the courtrooms with a Wizard of Oz theme to make this day exceptionally special for these special families and children!! If you are at the Courthouse on November 14, even if you're not involved in a case, please stop by the 169th or 264th Courtroom and watch as these families become 'forever' on this memorable day!!! The Bar Association will be sponsoring a legal clinic for veterans on Friday, November 7, 2014, at the Temple VA. A flyer with details is available here. We still need attorney and paralegal volunteers to help staff the clinic, and attorneys who are willing to take one or more cases/referrals from the clinic. No document prep is done on site. Some veterans have cases that can be resolved with just a short consultation. Some veterans have cases that require representation. Please fill out the three forms (here, here and here) and fax or email back to John Torti at Lone Star Legal Aid, and indicate whether you will be attending the clinic, and/or can take a referral from the clinic. PLEASE NOTE THAT YOU ARE NOT OBLIGATED TO ACCEPT A REFERRAL. Obviously, the more volunteers there are, the better the chance that every veteran is provided the legal assistance that they need. The Bell County Bar Association is pleased to announce the agenda for the 2014 Fall Bench Bar Conference which will be held in the 146th Judicial District Courtroom, Bell County Judicial Complex, on September 25, 2014. Check-in will begin at 8:15 a.m. The event is FREE to paid members of the BCBA and the BCBAP; while the non-member attorney cost is $50 at the time of registration, and the non-member paralegals cost is $30 at the time of registration. Note: If you have staff who are NOT members of the Paralegal group, they can attend the entire CLE for $25 OR just the e-filing portion for $10. Lunch and an afternoon snack are included! Early registration ends on September 23rd. WALK-INS WILL BE ACCEPTED, BUT ARE NOT GUARANTEED MATERIALS OR LUNCH. Please email bell_co_bar@yahoo.com if you plan to attend so we can get you registered as soon as possible!! The program has been approved for 5.75 hours participatory and one hour of ethics CLE credit.